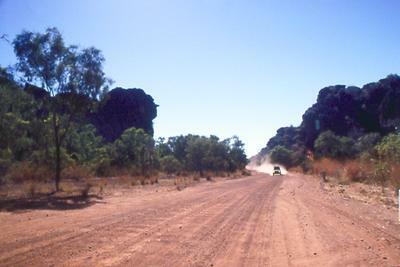 We traveled the Gibb River Road during June 2006. What a great trip!! We were led to believe that the road was in really bad condition but were pleasantly surprised to find it in pretty good condition still, probably because the heavy vehicles had not been allowed on the road yet. We did not have any punctures as we drove at +/- 90km and were in 4WD at all times. We spent the first night camping at El Questro. The hot springs are great, but get there early as they close for 'special guests' at noon. It was a bit expensive for what was on offer, although the food at the restaurant was good. The second night was at Home Valley Station where we watched the World Cup soccer! The people were very hospitable. The following day we were off to the Mitchell Plateau. When we came to the crossing at the King Edward River, a vehicle was stuck in the middle, as they had not kept up their revs and had stalled midway. Fortunately a vehicle came up behind us with somebody who happened to work for the RACV who towed them out. It was the deepest and roughest river crossing that we made. The Wandjina paintings across the river were amazing, as were the group just beyond the camp site. The drive to the Mitchell Falls was really great and then the walk to the falls was equally as good. Look out for the Bradshaw paintings, they are great. We took the helicopter ride back which was good to see the landscape. I can also recommend the plane trip to the Horizontal Waterfalls from either Derby or Broome. All in all a great trip, I just want to go back and do it all again!!! Glad you managed to find all the paintings. They sure are worth seeing!